Used gear is trending, as they say. The new retro relevance associated with secondhand hardware is rooted in a sense of fashion-forwardness the same way bell-bottom jeans come and go. More recent tech—think smartphones, video games, and tablets—is becoming more visible and attractive on the resale market, too, for reasons beyond generational nostalgia. For one, prices on new electronics continue to skyrocket. Tags on the latest-gen smartphones, from any brand, are at or near four-figures and rising, outside of contracts. This level of investment and constant reinvestment is unsustainable for most consumers. Used gear is universally sold at a tiny fraction of its original price. Past the clear financial advantages of buying used electronics, a larger-scale benefit is seen in the incremental reduction of e-junk—a trend of a different kind—from choking the world's finite landfill space. What's more, our own upgrade and update-dependent culture has created a flood of functioning tech on the resale market, disposed of due to a lack of features rather than function. Items like these are still useful if you can find them, confirm their viability, and arrange for safe payment and delivery. 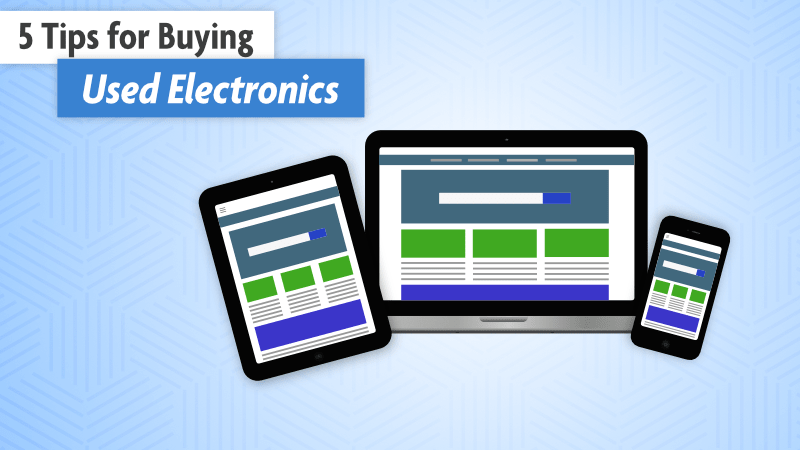 These important variables, and a few more, can make it tricky to get the best used electronics. That's why we've gathered a list of best practices and trusted resale retailers as they relate to finding and buying secondhand tech. Seek secure payment options - Identity and bank fraud linger as risks to conducting questionable online purchases. Confirm a site's security credentials and keep copies of all receipts and correspondence. Get social - Social media has all but replaced the community classifieds section. Keep an eye on your timeline for local deals on Facebook Marketplace; you'll be surprised what you find listed there, especially in the always popular "free" section. Go for a walk down memory lane - On the other hand, the digitization of society has left a generation's-worth of dynamite garage, yard, and estate sales go under-picked. This is where you'll find the most unique items, but also represents a scenario at which you'll want to apply all or most of the above lessons. Learn how to get rid of old electronics responsibly here!